Try using task cards on your computers and mobile devices! Now you can use this set of Fact and Opinion Task Cards in digital format on Boom Learning℠ with your students for free! No printing, cutting, or laminating, just assign the decks to your students and you are ready to go. Students get immediate feedback on their progress and you get a suite of teacher reporting tools. Fun, effective, and easy to use. Perfect for the paperless classroom. Download this free PDF with a link that will give you access to the cards on Boom Learning! Boom Cards play on any modern browsers on interactive whiteboards, desktops, laptops, netbooks, Chromebooks, iPads, iPhones, Android tablets and phones, and Kindle-Fire tablets. Boom Cards apps are on The App Store, Google Play, and the Amazon Kindle Fire store. To redeem your Boom Cards, you will create an account for Boom Learning. 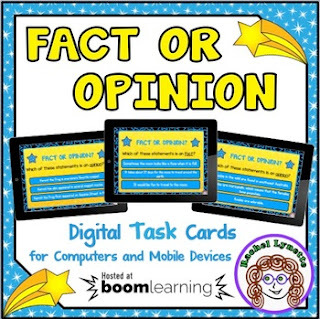 The account you get with your purchase allows you to play the Boom Cards on interactive whiteboards and with individual students using Fast Play. Fast Play does not save student progress reports. Boom Learning will give customers who are new to Boom Cards, for one year, and at no charge, the ability to collect and maintain student progress reports for up to 80 students. To collect and maintain student progress reports, you must assign students individual usernames and passwords. At the end of the one-year period, you will need to purchase a paid account to continuing saving student progress reporting.